Looking for a family dinner that pleases everybody? Make my quick & easy spaghetti & meatballs! It only takes 35 minutes to make this delicious family favorite, all from scratch, and I promise you will never have leftovers. The lean meatballs are made with ground sirloin and they are super soft because they cook right in the sauce. The sauce is my quick & easy spaghetti sauce and I just add the meatballs (& spaghetti) to make this a complete meal… but don’t forget the salad. This is really a quick & easy recipe because the sauce takes 5 minutes of prep and the meatballs take 10 minutes to put together. Then it all cooks in one pot and you have the most delicious spaghetti dinner. The sauce needs to cover the meatballs and the pot I use measures 7 1/2 inches across. If your pot is bigger than that, you might need to make more, smaller meatballs so they are covered by the sauce. Marinara sauce does not need to cook for hours on the stove. My recipe uses canned plum tomatoes, the best kind for sauce, and I prefer a smooth sauce so I puree the whole tomatoes first. If you like it more chunky, you can cut the tomatoes up with scissors or a knife for a chunkier sauce. These meatballs and so soft they really just melt in your mouth. That’s because I use fresh bread crumbs and not dried ones. To make fresh crumbs, which are just soft bread in tiny pieces, I process two slices of bread in a food processor. Then I just wipe out the bowl and use the same one to puree the tomatoes. 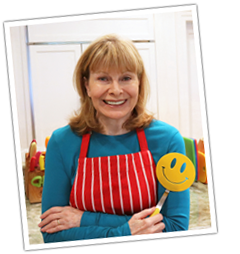 If you don’t have a food processor, you can cut the bread into small pieces and puree the tomatoes in a blender. 4 Comments on "Quick & Easy Spaghetti & Meatballs"
Well I made this 3 times now. Easy & Awesome. My Sister-in-Law gave me her spaghetti & meatball recipe ,which we followed for years. Not any more. This one,as far as I’m concerned beats the all day sauce. The meatballs are so tender & juicy. Thanks Jenny. 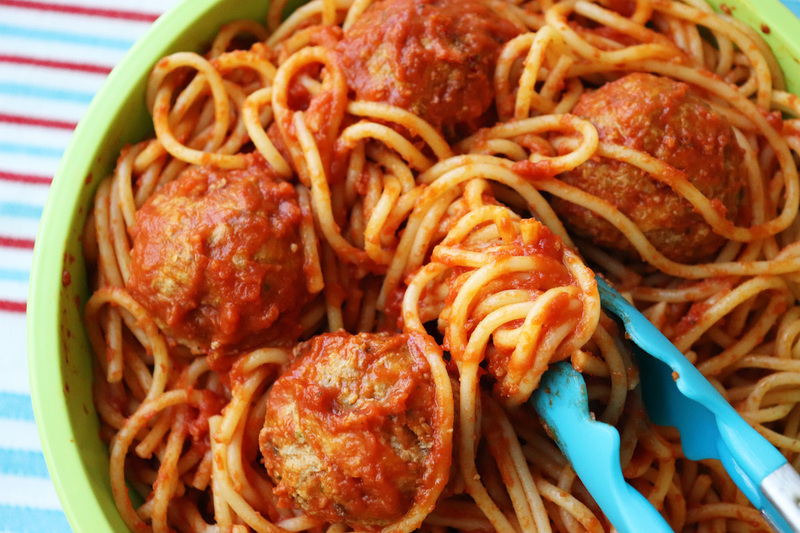 My grandchildren love spaghetti & meatballs…..this sounds so good and easy….can’t wait to make it for them!! !